Phil Mickelson, hoping to win his first U.S. Open, is making a last minute change. According to NBC on YahooSports, to cite sources, on the eve of arguably the most important tournament of his career, Mickelson revealed that he will at least begin this 114th U.S. Open with a tweak to his putting grip by returning to the claw. Phil Mickelson is hoping to win his first U.S. Open in 2014. Mickelson said Tuesday during his pre-tournament news conference: “I tend to do well when it’s least expected…. This is giving me a chance to put the best roll on the golf ball,” he said. “Right now the game plan is ‘X’, but it could be ‘Y’ in a matter of minutes….You have to be willing to take risks and be accountable. According to the NBC Sports article, Mickelson used the claw grip during a final-round 72 at the FedEx St. Jude Classic, a tournament, he said, that he should have won “by eight” if he had been putting “decent.” For the season he is ranked 103rd in strokes gained-putting. 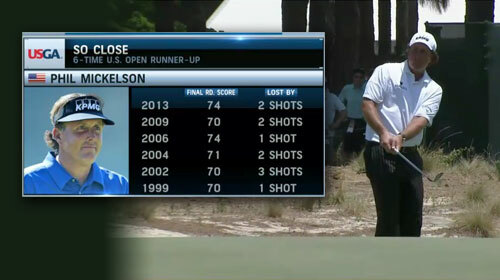 Mickelson has won four major championships and a total of 41 events on the PGA Tour. He reached a career high world ranking of 2nd in multiple years. He is nicknamed “Lefty” for his left-handed swing, even though he is otherwise right-handed. He was elected into the World Golf Hall of Fame in Nov. 2011 and inducted in May 2012.